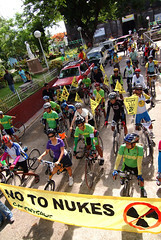 Volunteers of Greenpeace, Livestrong and Firefly Brigade leave Morong, Bataan. After a few mishaps last night including an injury, car problem and hours of delay. We arrived exhausted. It was there in Morong that we all spent the night in an elementary school classroom. By 5AM the following morning I was surprised that the sun was almost up, and the folks from Live Strong were already prepared and warming up in the basketball court adjacent to the room where we were all sleeping. Signage that marks the location of the Bataan Nuclear Power Plant. At 7:30 AM we were already reciting the responsorial Psalm at the send-off liturgy that was led by Fr. Ronnie of the Diocese of Morong, and the Nuclear-Free Bataan Movement (NFBM), by the time he sprinkled the bikers with his blessing we were off, from the town proper of Morong to the gate of the Bataan Nuclear Power Plant (BNPP), there we took pictures at the guarded gates of the plant. I believe that one reason why the powers that be in the government and the energy sector are all keen on pushing for the revival the Bataan Nuclear Power Plant is partly because of the fact that we all have come to believe that Bataan is too far off from Manila, for it to affect us in the event of a nuclear accident. I was surprised when I opened the Greenpeace Youtube channel this morning. I got a message on our inbox coming from veterans of the historic anti-Bataan Nuclear Power Plant (BNPP), campaign in the 80s. The message was from the NUKLUS Band, an alternative and progressive rock band that performed during the 80’s. They were the ones who composed the song “Dambuhala Sa Morong” (Monster of Morong), in 1980 which became the battle-cry of the Philippine anti-nukes movement at the time.